BACC conservators are experienced in the examination, treatment, and care of artifacts composed of paper, paper-related, or parchment supports. We have successfully treated a broad range of objects, from seventeenth-century South Asian paintings delicately rendered in opaque watercolor to large-scale photographs by Richard Avedon. Rembrandt etchings, Toulouse-Lautrec posters, historic artifacts, and drawings and prints by modern American masters such as Charles Burchfield have all been treated to great success in our paper department. Routine treatment procedures for works on paper include cleaning to remove surface dirt, bathing to reduce stains and to flush deterioration products from paper, stain reduction steps, mending of tears, removal of old repairs or adhesives, reinforcement to enhance stability, and re-housing with preservation quality materials. Our paper conservators are trained to address both structural and aesthetic concerns in the development of appropriate treatments. 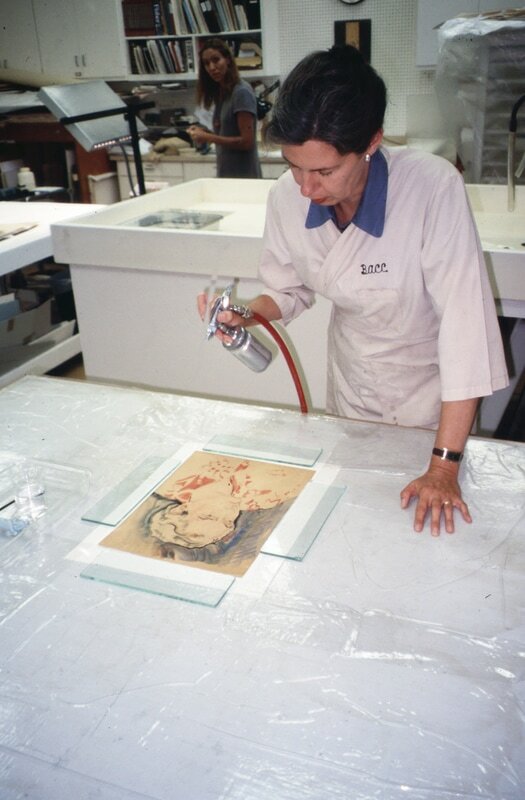 BACC conservators are regularly engaged in technical analysis procedures, such as the study of paper composition and manufacture, which support art historical research. The variety of works on paper that are brought into BACC for treatment provide excellent learning opportunities for internships. Collection-based institutions have utilized BACC’s paper conservators in the evaluation of environmental conditions and the design of storage facilities to ensure maximum protection for their holdings. Such projects have involved collections consisting of thousands of individual works.